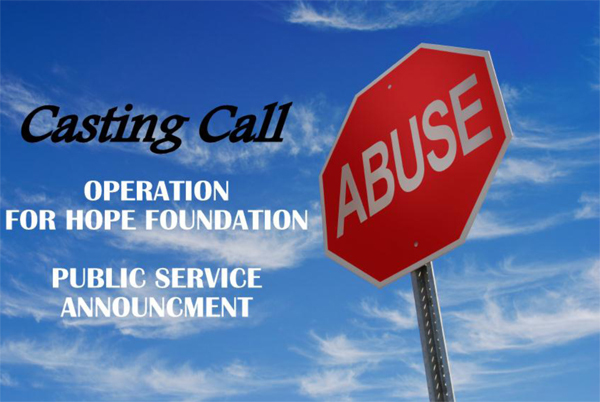 Operation for HOPE Foundation is looking for talented individuals who would be willing to donate their time towards creation of Public Service Announcement. Selection of participants is based on need in our outreach to a broad and national audience. All are encouraged to inquire, ages 4 and up. Minors, please have a parent, guardian or youth leader email us with your interest in upcoming projects. Community service hours provided. Involvement is rewarding and fun! Video and Photo Releases will be required by all Public Service Announcement participants. To learn more about the work of the Foundation, please visit www.operationforhope.org.